John of Dumbleton (in Gloucestershire, between Cheltenham and Evesham), who died in 1349, spent most of his life in Oxford, and was a member of a group of mathematicians who studied kinematics, and were the first to develop the 'Mean Speed Theorem' in 1334. He is most famous for having written the present work. 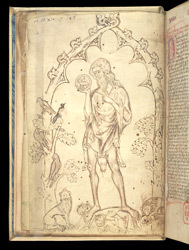 On a previously blank flyleaf, is this unusual added image of John the Baptist. He wears his camel-skin cloak (still with its hooves and head), and stands on Herodias (who was responsible for his death) within a part-vegetal, part architectural niche, which includes semi-naturalistic birds and animals, and a hedgehog as depicted in the Bestiary.